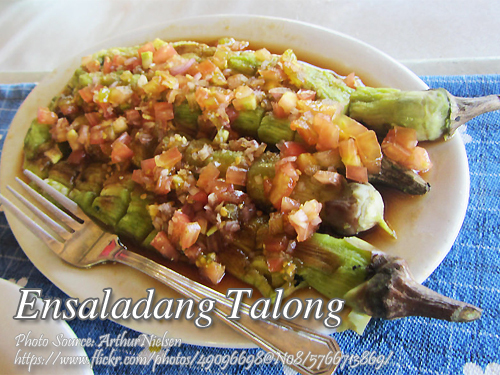 This ensaladang talong or eggplant salad is easy to prepare but you will be surprised that it is tasty because the eggplants are broiled over burning charcoal. Unlike if you will only boil it or fry the eggplants which will not be as tasty as broiling it on charcoal. Preparing this salad is simple, the broiled eggplants is, skinned and served with kalamansi or lime juice, garlic, onions, salt and pepper then garnished with sliced tomatoes. This is also perfect as a side dish of broiled or fried fish, pork or chicken. Broil eggplants over live coals. When done remove skin and place on a platter. Combine kalamansi juice, garlic, onions, salt and pepper. Pour over the eggplants. Garnish with sliced tomatoes. Yield: 6 servings.